Before we get to the Flashback today I wanted to speak on the new poll that I started above. 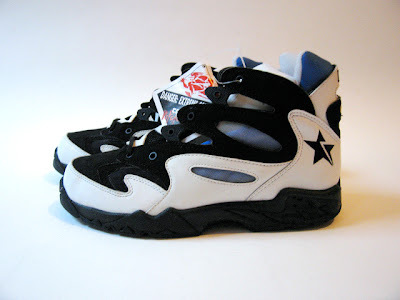 I was looking at the list of All Star's and then got to thinking about their footwear. So I picked the Nike athletes who are in the All Star game, that don't currently have signature shoes being made. This is why Kobe, LeBron, Amare, Pierce are not on the poll. I also made this poll where you can vote for more than one at a time. Now, lets get to today's Friday Flashback. I am not sure of the exact name, but it comes from the Converse Psycho Training brand. 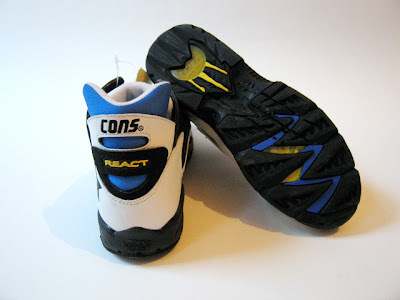 These shoes featured React in the heel and forefoot. I also think from the pictures that they had some sort of inner booty, they almost remind me of Nike Huarache. I also really enjoy the high heel padding, it just really looks comfortable. 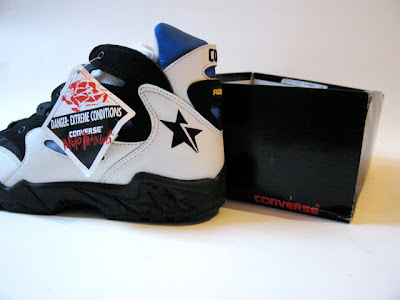 I am not sure how many models for made in the Converse Psycho Training line, but they all had React and were pretty wild looking. Thanks for checking out the blog and remember to vote in the poll above.